Kids like to sing along! Making A Friend / My Stand On Respect and more. This is a great video designed for kids in grades 7-8. Content features real kids talking about Respect, as well as fun videos that will keep kids attention while learning about this important topic. This is a package featuring the Stand Up Against Bullying CD, and the Stand Up For Respect DVD. Designed for ages 7-11, your children will be entertained while learning about the concepts of respect and bullying. This is a great package including two of our best selling products. The Junior level Stand Up For Respect DVD features fun videos designed for kids ages 7-11. 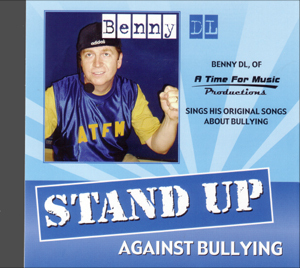 The Stand Up Against Bullying CD has 9 tracks of music that kids enjoy.